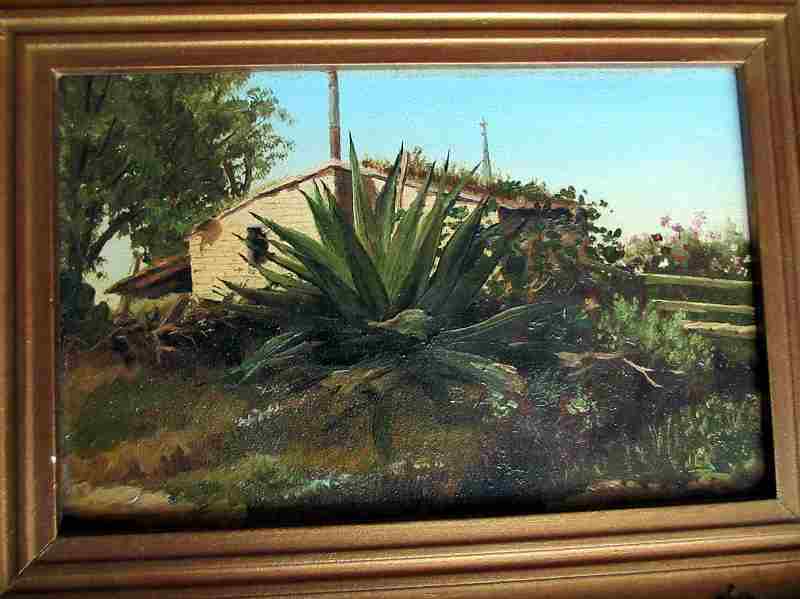 Spanish Yucca with a building in the background, oil on board, signed J.E.R., c1920. 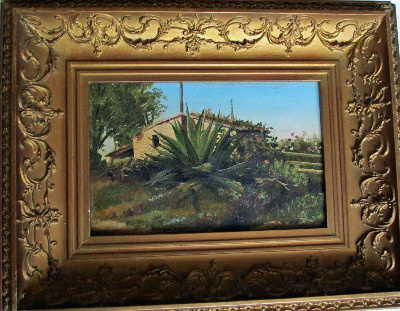 Spanish Yucca, oil on board, signed monogram J.E.R., c1920. 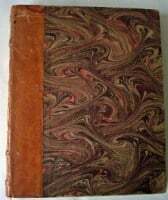 SOLD 17.12.2014. Oil on board, signed monogram. Dimensions : Frame : 370mm x 290mm x 45mm. Image : 220mm x 140mm. 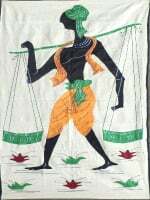 Weight : 1.150kg net. Condition : Good. Spanish Yucca, oil on board, signed monogram J.E.R. lower rh corner. Framed. Dimensions : Frame : 370mm x 290mm x 45mm. Image : 220mm x 140mm. Condition/Notes : Good. 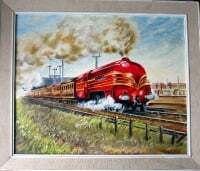 The oil painting on board is in good condition with good strong colour. 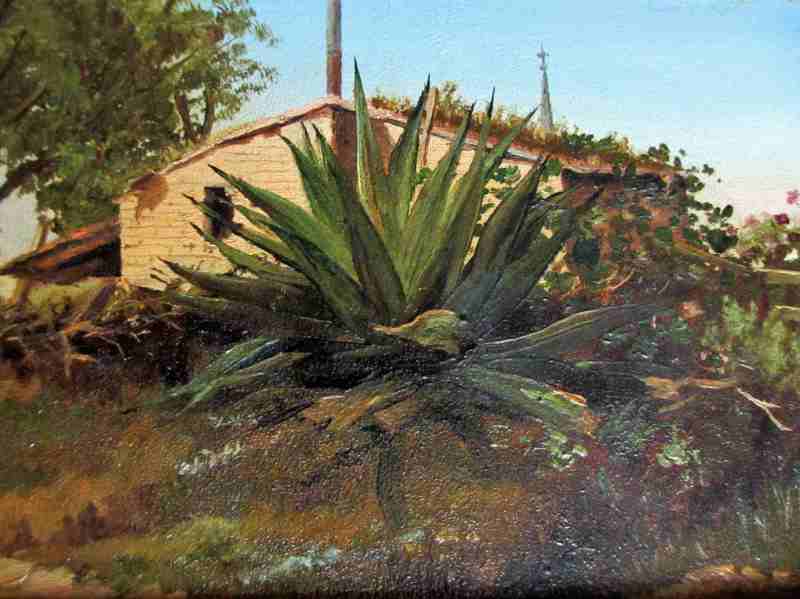 The painting depicts a Spanish Yucca plant in lush surroundings and a building in the background. 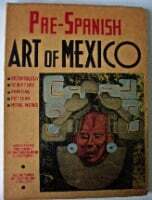 Early 20th Century Continental School estimated c1920. 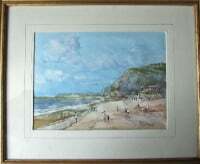 The painting is signed by the artist in monogram J.E.S. which has yet to be identified. 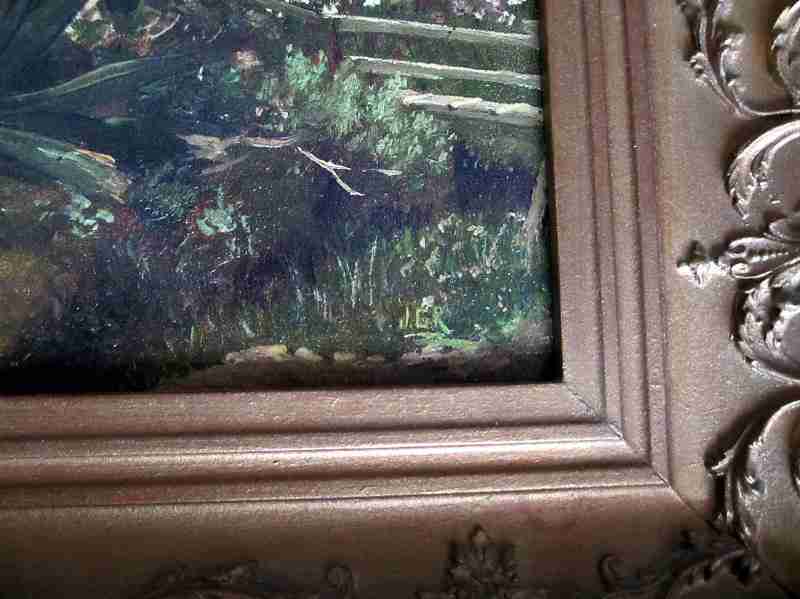 The painting is framed in an attractive gilt moulded frame which has considerable decorative surround and is in good condition. There are a few chips to the sides of the frame but basically sound and sturdy. 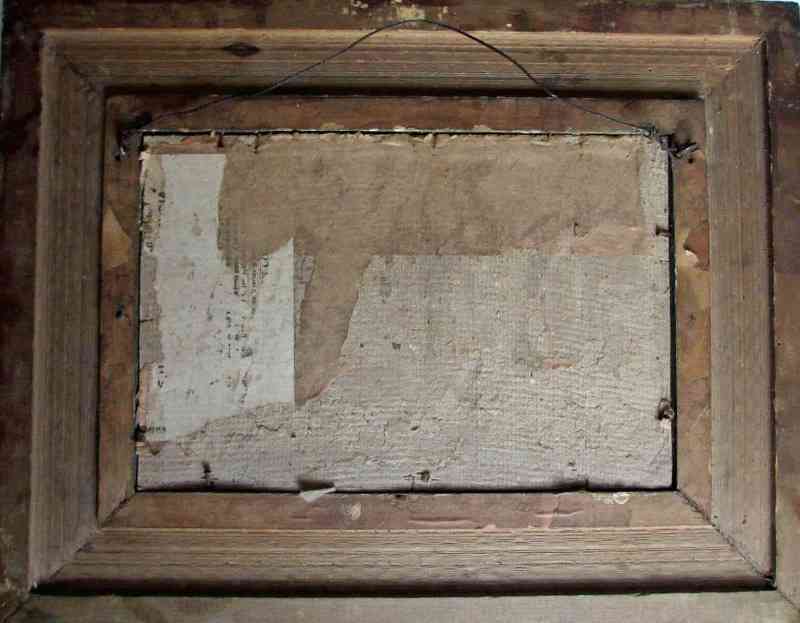 The back of the frame is plane wood with a heavy cardboard backing nailed in position. 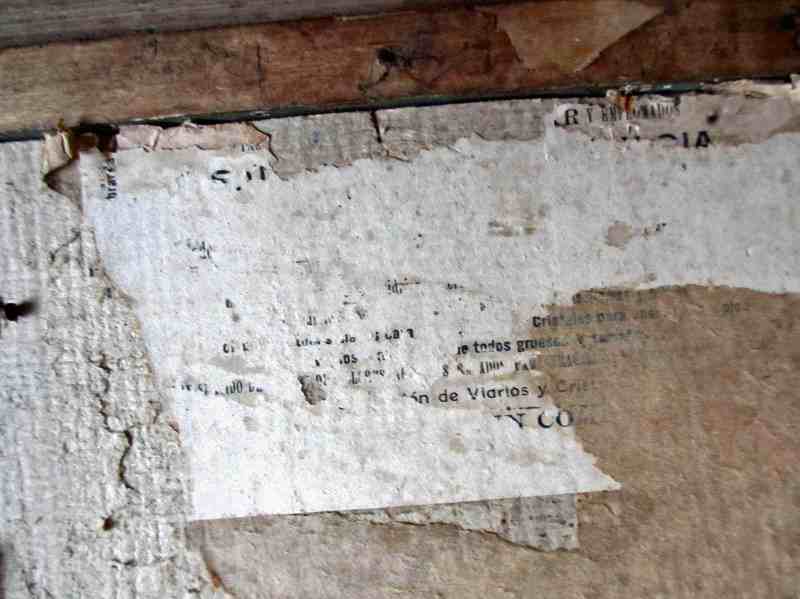 There is part of an old label with Spanish script attached to the lh side of the board but most of the script has been erased. Old screw-eyes and wire attached. Please see the detailed image of the label below. 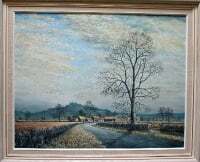 The painting can be shipped with or without the frame as desired. Euro/World : FIXED RATE 3/M. Euro/World : FIXED RATE 2/DISCOUNT RATE.